While powertrain system design and its control integration are traditionally divided into two different functional groups, a growing trend introduces the integration of more electronics (sensors, actuators, and controls) into the powertrain system. This has impacted the dynamics of the system, changing the traditional mechanical powertrain into a mechatronic powertrain, and creating new opportunities for improved efficiency. Design and Control of Automotive Propulsion Systems focuses on the ICE-based automotive powertrain system (while presenting the alternative powertrain systems where appropriate). Factoring in the multidisciplinary nature of the automotive propulsion system, this text does two things—adopts a holistic approach to the subject, especially focusing on the relationship between propulsion system design and its dynamics and electronic control, and covers all major propulsion system components, from internal combustion engines to transmissions and hybrid powertrains. Design and Control of Automotive Propulsion Systems provides the background of the automotive propulsion system, highlights its challenges and opportunities, and shows the detailed procedures for calculating vehicle power demand and the associated powertrain operating conditions. Dr. Zongxuan Sun is an associate professor of mechanical engineering at the University of Minnesota, Minneapolis. He was a researcher from 2000 to 2007 at the General Motors Research and Development Center in Warren, Michigan. Dr. Sun received his BS in automatic control from Southeast University, Nanjing, China, in 1995, and his MS and PhD in mechanical engineering from the University of Illinois at Urbana-Champaign, in 1998 and 2000, respectively. He has published more than 90 refereed technical papers and received 19 U.S. patents. His research interests include controls and mechatronics with applications to the automotive propulsion systems. Dr. Guoming (George) Zhu is a professor of mechanical engineering and electrical/computer engineering at Michigan State University. His BS and MS (1982 and 1984, respectively) were from Beijing University of Aeronautics and Astronautics in China. He has authored or coauthored more than 140 refereed technical papers and received 40 U.S. patents. He was an associate editor for ASME Journal of Dynamic Systems, Measurement, and Control and a member of the editorial board of International Journal of Powertrain. 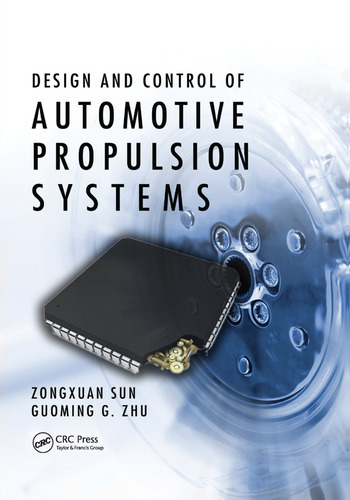 Dr. Zhu is a Fellow of the Society of Automotive Engineers (SAE) and American Society of Mechanical Engineers (ASME).